Molins said about 5,000 rounds were fired by police during an hourlong gunfight between heavily armed police and those inside the Saint-Denis hideout, the AP reports. Investigators found "a total war arsenal" of Kalashnikovs, ammo, and explosives, per the Guardian. 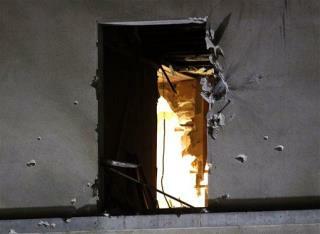 Law enforcement was bombarded with gunfire as they tried to fight their way in through a reinforced door, the AP notes. There's confusion whether alleged mastermind Abdelhamid Abaaoud was among those killed in the raid. Molins said during the press conference that two suspects were dead and eight arrested, though he said he can't yet ID them, per the Guardian. He added that neither Abaaoud nor Salah Abdeslam were among those arrested. But two anonymous senior EU intelligence officials tell the Washington Post that Abaaoud was indeed killed during the siege and that forensic experts had gathered evidence at the scene after the chaos had ended. The suspected terror cell was caught just in time, per authorities. "A new team of terrorists was neutralized and all indications are that given their arms, their organizational structure, and their determination, the commando could have struck," Molins said, per AFP. It's kill or be killed. Have at France. The civilized world is behind you. Radical Islam. There. That wasn't so hard to say.